Canada’s second largest airline WestJet faces formidable challenges in early 2016 driven by weak demand in the Canadian province of Alberta, home province of its largest hub and headquarters, Calgary. Softening conditions that lingered over the region throughout most of 2015 began to worsen quickly in 4Q2015, forcing WestJet to adjust its capacity projections slightly for 2016. The sharp decline in demand in Alberta is pushing WestJet’s 1Q2016 unit revenues down by 7% to 10%, and is also pressuring the airline’s margins in the short term. Although visibility for the latter half of 2016 remains somewhat murky, for now WestJet believes that its unit revenues will progressively improve after 1Q2016. Weakening unit revenue, compressed margins and still high capacity growth have combined to dull confidence in WestJet among some of the airline’s investors. The airline’s stock price has halved during the last year, and questions are arising whether the airline is taking on too much risk with its growth plans, at a time when Canada’s projected economic growth for 2016 is below 2%. WestJet maintains that it is managing its business for the long term; but for now the market is not welcoming that message, and is looking for more short term assurance that WestJet can manage its current challenges. Throughout most of 2015 WestJet cited softness in Alberta, whose economy is highly dependent on the energy sector. Conditions in that region have faltered due to the collapse in oil prices, which fell below USD30 in early 2016. Although in mid-2015 WestJet stated that it was tough to determine when the pressure in Alberta would bottom out, the company’s executives remarked that the province’s routes were still performing well on an absolute basis. Lower fuel prices were also allowing WestJet some liberty to act more aggressively on fares. 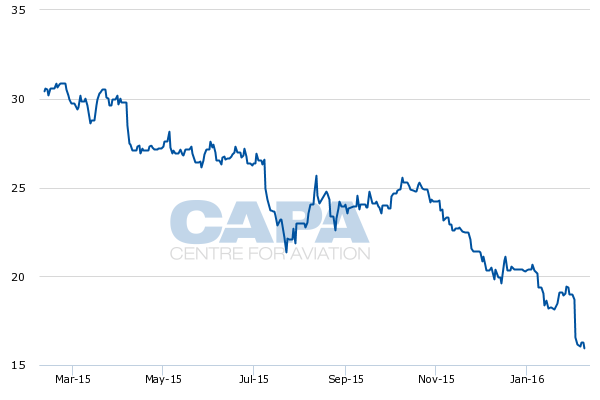 But conditions deteriorated sharply during 4Q2015, according to WestJet. Company CEO Gregg Saretsky recently remarked that the decline was sharp and deep. WestJet is attributing 700 to 900 basis points of the projected 7% to 10% unit revenue decline in 1Q2016 to weakness in Alberta. In early Feb-2016 Mr Saretsky stated that approximately 25% of WestJet’s system capacity originated in Alberta and 40% of its supply touched the region. 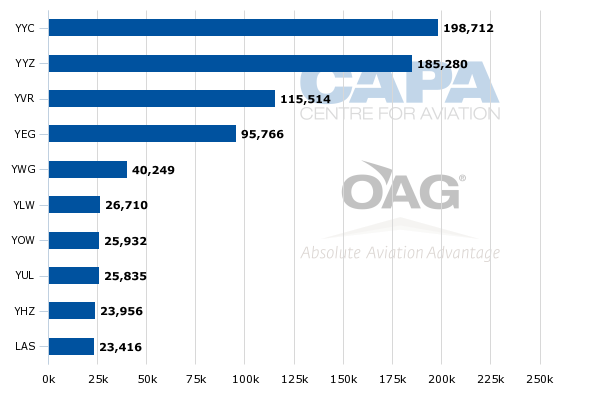 Data from CAPA and OAG for the week of 8-Feb-2016 to 14-Feb-2016 show that Calgary and Edmonton – both located in Alberta – are WestJet’s first and fourth largest bases measured by seat deployment. Those two cities are also the airline’s largest and fourth largest measured by frequencies. WestJet serves roughly 47 destinations from Calgary and 26 from Edmonton. WestJet plans to cut capacity in Alberta by 5% in 3Q2015, and as a result of the decrease its system capacity projections for 2016 have changed from 8% to 11% to a still robust 7% to 10%. Roughly 6ppt of WestJet’s planned capacity growth in 2016 is stemming from the addition of four Boeing 767 widebody aircraft that the airline plans to deploy to Hawaii and to London Gatwick from St John’s, Toronto, Winnipeg, Edmonton, Calgary and Vancouver, beginning in May-2016. Near the end of 2015 WestJet found itself in a position of defending its entry into the long haul, non-stop trans-Atlantic market (it has served Dublin and Glasgow for a couple of years with one-stop flights). At the beginning of 2016 some investors were still questioning the logic of undertaking widebody expansion and the accompanying capacity growth during a time when WestJet’s margins and yields were under pressure. Its yields could fall by 7% in 1Q2016, and EBIT margins are likely to contract for the first three months of 2016. 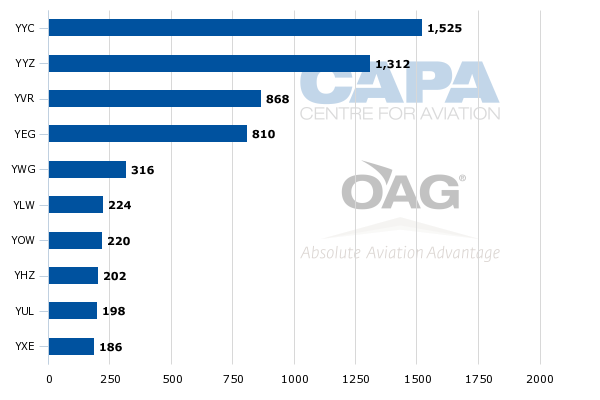 WestJet’s logic is that it is acquiring older aircraft – Boeing 767s – that require a low capital expenditure and are efficient for the long haul operating profile in a low fuel cost environment. Mr Saretsky also stated that forward bookings on the service are robust, particularly for point of sale in the UK. The airline believes that the weakness it is encountering during 1Q2016 is entirely driven by challenges in Alberta. For now, WestJet has no plans to further adjust its capacity downward; however, Mr Saretsky did state that if the rest of Canada “catches a cold from Alberta”, then WestJet would need to revisit its capacity plan. WestJet is considering some fleet adjustments in 2016 and 2017 as it works to determine how long conditions will remain weak in Alberta, and if demand patterns will change in the rest of Canada’s domestic market. During 2016 the airline plans to return three aircraft to lessors, and has stated that it is exploring options to return six aircraft that are up for lease renewals in 2017. WestJet is also exploring options to defer Boeing narrowbody deliveries scheduled for 4Q2015. As of 10-Feb-2016 WestJet operated a total of 117 Boeing narrowbodies in its mainline fleet. Orders include those placed directly by the operator and by lessors assigned to the operator, from 10-Feb-2016 onwards. The airline has a total of five 737-800 narrowbodies scheduled for delivery in 2016. It is scheduled to begin taking delivery of 737 Max 8 jets in 2017. Firm orders include those placed directly by the operator and by lessors assigned to the operator, from 8-Feb-2016 onwards. Excludes aircraft for which the delivery date has not been announced or cannot be reasonably projected, or the aircraft is unlikely to be delivered. At the same time as WestJet’s unit revenues are falling sharply, its unit costs are rising. Its unit costs excluding fuel and profit sharing are growing 7.5% to 8% year-on-year in 1Q2016. Currently, the airline expects flat to 2% unit cost growth for the full year 2016. That is a slight revision upwards from a previous forecast for a 0.5% decrease to a 1.5% increase in 2016’s unit cost. The marked rise in WestJet’s 1Q2016 unit costs is driven by higher depreciation and amortisation expense and the continued weakness of the CAD against the USD. None of WestJet’s assurances that it is building its business for the long term have been effective in shifting the opinion of some shareholders that the airline perhaps needs to slow its growth in order to gain some pricing traction, shoring up yields. Its share price in early Feb-2016 had been cut in half year-on-year. 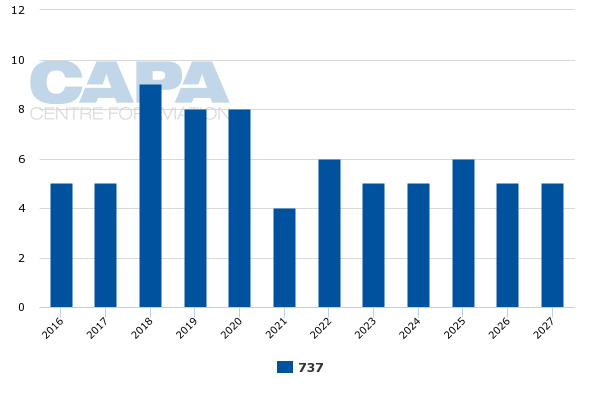 Even with the slight adjustments that WestJet has made to its capacity projections, the 7% at the low end of its forecast is higher than the 6.1% annual average growth the airline posted for 2012 to 2015. The arguments that US airlines are making to justify their capacity growth – record top line profits and margin expansion– do not apply to WestJet in the short term. 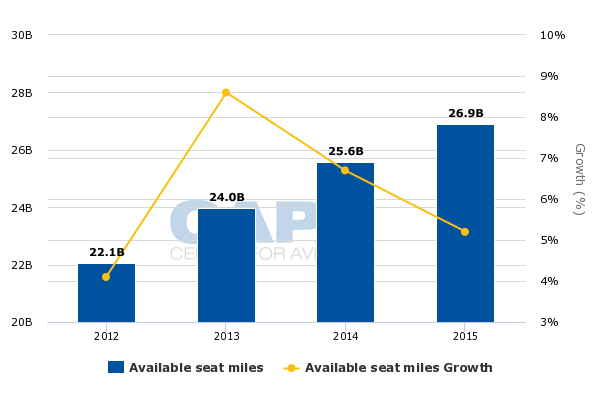 The airline seems poised to pull back on its growth if conditions in the rest of Canada worsen, but it seems that investors prefer a pull-down of capacity during 1H2016 rather than waiting to see how the environment evolves in 2H2016. WestJet will no doubt continue to deliver profitability in 2016. But its stock valuations could remain under pressure throughout most of the year, driven by a weaker performance in 1Q2016 and an uncertain outlook for the remainder of the year. The company believes that it cannot put the evolution of its business on hold due to what it characterises as temporary challenges, and it is pressing ahead with the introduction of low fare service in Canada’s trans-Atlantic market. The company’s performance on those routes will no doubt be highly scrutinised by its competitors and investors alike.